Marcus Scott, of the Beautiful Nights Facebook page and fan parties, will bring some Chicago flavor to the San Francisco Bay Area this New Year's Eve. 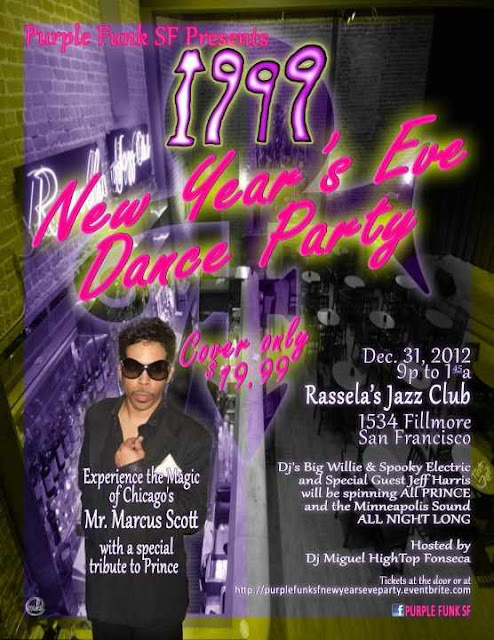 Purple Funk SF, a group dedicated to celebrating Prince's music, will present an end-of-the-year bash, "1999 New Year's Eve Dance Party" at 9 p.m. Dec. 31 at Rassela's Jazz Club, 1534 Fillmore St., San Francisco. The cost is $19.99 and the night's theme will be 1999, in honor of Prince's 1982 breakthrough album. The event will be hosted by DJ Miguel "Hightop" Fonseca. Special guests include Scott, who is traveling from the Midwest and Jeff Harris, a local DJ best known for his work with the Prince vs. Michael Jackson parties. The party will feature mainstream, as well as unreleased, songs, music videos and a special performance by Scott. Christophur T will oversee art direction and Evol Knight will be the event photographer. “It will be a beautiful purple funky night,” said Christophur T, of Purple Funk SF. The group consists of Fonseca, Christophur T, Willie Adams, aka DJ Spooky Electric, Evol Knight and Monya K. The idea was born after Prince made a stop in Oakland for the Welcome 2 America Tour in 2011. Not long after, Fonseca approached Adams about reviving all-Prince parties in the Bay Area, in the spirit of now defunct Prince fan groups like the Dream Factory and Bay NPG (New Power Generation), Adams said. Adams then tapped Christophur T to come on board, since the two had collaborated in the past to throw Prince parties in the Bay Area, the last one being held in 2008. The Purple Funk SF group held their first party in June 2012, which featured a live Prince tribute by The Scoundrels. Adams and Christophur T both met Scott when he traveled to California in June 2008 to attend one of their parties in Berkeley. Christophur T said that he had mistaken Scott for another well-known Prince fan Sir Jack based in Santa Cruz, Calif. and greeted him as such before realizing his mistake. However, the two connected that night and have periodically kept in touch, via Facebook and by telephone. Adams recalled another meeting, also in 2008, when Scott attended a party where he was the DJ in San Jose. He said that after he was done playing, Scott told him he liked his style and gave him a copy of “21 Nights,” a coffee table book featuring Prince, that had just been released at the time. He said he was “blown away” by the gesture and never forgot it. He has not seen Scott since that last meeting, but, they have also kept in touch since then. When Scott started Beautiful Nights, he reached out to members of Purple Funk SF and they in turn, invited him to collaborate with them on their New Year's Eve party. They have been in talks since the Beautiful Nights team was planning their first party, which took place in November 2012, and featured Maya and Nandy McClean, better known as The Twinz, who have worked extensively with Prince, Adams said. Scott said he is looking forward to visiting the Bay Area again for the first time in more than three years, performing at the party and meeting new people. He said he hopes this party will bring the focus back to Prince's music and uniting fans from all walks of life. Adams said he wanted fans to know that this will be a one-of-a-kind event and anybody into the “purple culture,” will not want to miss it. Lead photo courtesy of Purple Funk SF. Thanks for sharing about the dance party. Went for birthday party of my neighbor's son last month. Their taste of hiring one of the superb Los Angeles venues was out of the world. DIY décor and invites were done with green theme color. All kids were given lovely attractive return gifts. Thinking for same venue booking for my brother's success party too.